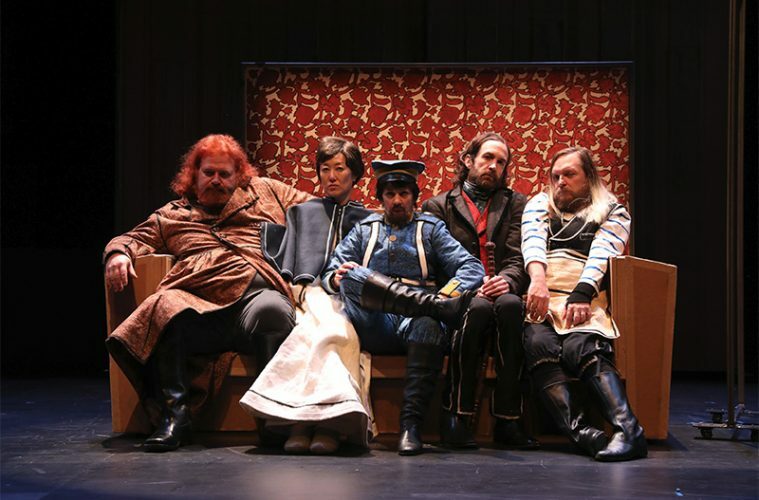 Lowell Bartholomee, Mari Akita, Lana Lesley, Thomas Graves, and Robert S. Fisher in Field Guide, created by Rude Mechs, Yale Repertory Theatre, January 2018. Photo by Joan Marcus. The plays change but the players remain the same: Such is the model of a resident acting company, a group of artists who create theater together as a team. A way of theater-making older than the King’s Men, which counted Shakespeare as a member, acting companies still remain prevalent in Europe. In the U.S, the resident company model spread with the development of regional theaters across the land, until the 1980s when many theaters moved to a gig model. Dallas Theater Center Artistic Director Kevin Moriarty directing Public Works Dallas The Tempest. Photo by Kim Leeson. Whether a fluke of geography or perhaps some remnant of Texas’ prominence in the regional theater movement (with pioneer theater women like Margo Jones in Dallas and the Alley Theatre founder Nina Vance establishing footholds in the 1940s), it perhaps defies chance that two of the largest theaters in Texas, The Alley and Dallas Theater Center both keep resident acting companies as an intrinsic part of their identity. Meanwhile, smaller theater collectives, like Austin’s Rude Mechs, continue to make original work as a company. Rob Melrose, the new artistic director of the Alley, traces the demise of the resident company model in the U.S to two factors: money and diversity. In a country where art is seldom significantly subsidized by the government, paying an actor per gig is usually cheaper. Furthermore, a resident company of mostly white actors doesn’t allow for a multitude of stories to be told. 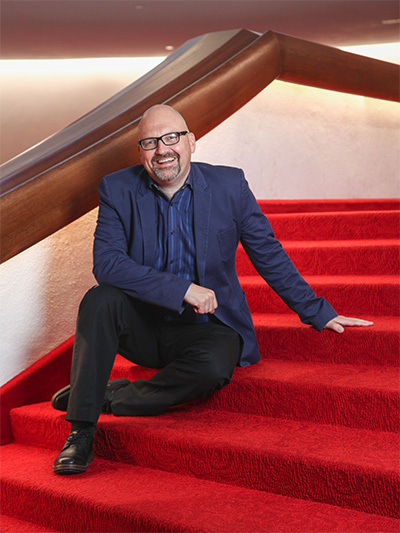 Rob Melose, Artistic director of the Alley Theatre; photo by John Everett. Melrose was raised on shows at The Guthrie Theater in Minneapolis, which at the time had a resident company. He says watching the same actors tackle different roles and genres taught him much about acting and directing. When he co-founded Cutting Ball Theater in San Francisco, its size didn’t allow for a full resident company, but he did establish a troupe of associate artists. “I wanted to have a group of actors who understood what kind of theater we were trying to make, and I didn’t want to have to teach a new group every show,” he explains. That became Kevin Moriarty’s challenge upon his arrival at the Dallas Theater Center in 2007. DTC had a resident company from its beginnings in 1959, but discontinued it in the 80s, like many regional theaters. Early in his tenure, Moriarty realized he was the only full time professional artist in the building and that didn’t necessarily lead to great theater, no matter how stellar the administrative staff. Jon Shaver, Sally Nystuen Vahle, Christopher Llewyn Ramirez and Liz Mikel in the Dallas Theater Center production of Lynn Nottage’s Sweat. Photo by Evan Michael Woods. 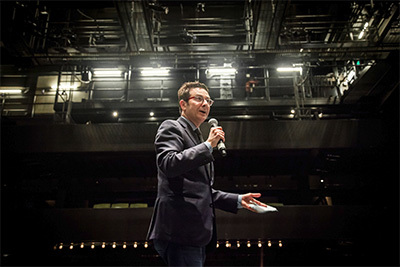 At the same time, he found bringing in actors, directors and designers from other cities sometimes disconnected the art from Dallas audiences. 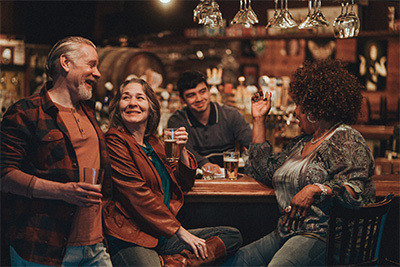 Establishing the Brierley Resident Acting Company with actors who lived and created in the city would also help create a community of artists inside the theater who were deeply tied to the greater Dallas community. Melrose proclaims a similar philosophy, using the analogy of farm-to-table restaurants to explain how he wants to direct with the best, local ingredients. Of course, those ingredients will also influence how the A.D. chef creates a seasonal menu. Focusing on some of the practicalities of programming a season for a resident company, Melrose explains that most of the time, the economical two-person play doesn’t help him. “I read the plays with our company in mind and think about where everybody fits,” say Melrose. “If we’re going to have 8 to 10 actors committed to being in the company, I’ve got to make sure they’re busy over the course of a season.” He does note that the Alley’s two stages allows simultaneously producing an intimate play with imported actors and an expansive company production. As he settles into his new role, Melrose says one of his goals will be to bring more diversity into the company, while also defining what the company means for individual actors, admitting it’s been “nebulous” in the past. 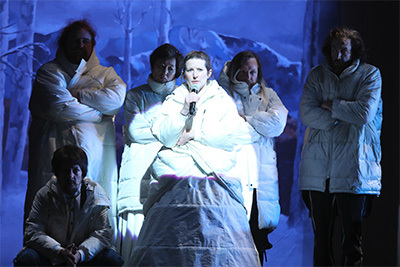 Hannah Kenah, Lana Lesley, Lowell Bartholomee, Mari Akita, Robert S. Fisher, and Thomas Graves in Field Guide, created by Rude Mechs, Yale Repertory Theatre, January 2018. Photo by Joan Marcus. Yet if Dallas and Houston have defied current regional theater norms with an old theater model, Austin’s Rude Mechs have gone positively ancient, embracing the archetype of roaming players who can create new works whenever they find a willing audience. The Mechs call themselves an ensemble-based theater collective, one with five co-producing artistic directors. Theirs is another form of company that perhaps works well for the keep-Austin-weird environment it evolved within. “When we start a new project, we invite everyone in the company to take part in the process, and usually end up working with whoever showed up,” explains Lesley. Perhaps it’s that sense of family and community, along with that famous lone star pride that keeps the resident acting company model alive in Texas. “I think a great city, like Dallas, like Houston, like Austin, needs artists living in and among the people and creating work with and for the people, which is a very different thing than importing somebody to tell a story that’s on their mind in New York or in LA,” affirms Moriarty.